IndustryInsight A The Use of Flow Aid Additives Joe Marinelli joe@solidshandlingtech.com As markets handling bulk materials become more com- petitive, plants must find ways to improve, making reli- able material flow imperative. Prior to the seminal work of Dr. Andrew Jenike in Bulletin 123, much of bulk sol- ids handling relied upon trial and error. Dr. Jenike cre- ated a scientific approach to solids handling, whereby a material's flow properties could be empirically measured in a laboratory, and recommendations developed based on those values. Flow property testing requires direct shear testing where the cohesive and wall friction properties of a ma- terial are measured. These tests can be completed on a variety of ASTM certified devices, such as the Jenike Shear Tester. In Bulletin 123, Jenike laid out a series of procedures to design bins to achieve reliable flow based on these flow properties. Preferably, bulk solids should flow by gravity. However in those instances where gravity alone is insufficient, a flow aid can be implemented. Mechanical flow aids are those devices which impart mechanical energy to promote material flow. These cover a wide gambit of issues and applications, yet must be used appropriately. A lesser known type of flow aid is an additive. While a mechanical flow aid attempts to handle a material's properties, a flow aid additive changes the characteristics of a difficult flowing product. These chemical additives are solids or liquids that are mixed with a troublesome material. Flow additives such as fumed silica are mixed with extremely cohesive materials, breaking the cohesive bonds that form between particles. Other additives such as freeze conditioning agents prevent freezing problems in a system. A few of the many materials that have proved successful as flow aid additives include clay, flour, fly ash, quicklime, starch, and zeolite. Flow aids are to be used as a last resort. This may be when gravity flow alone is either impractical or is not possible. The use of flow additives requires a nuanced approach evaluating several criteria. Several factors to consider when assessing the viability and use of a flow additive include: • Quality: the material must still be useable after adding the flow additive. Is the product quality altered or rendered unacceptable? What effect does the additive have on the final product and its' effectiveness or use? • Quantity: how much additive is required to enhance flowability? What is the op- timal quantity to use? This will be a nexus of cost effectiveness and diminishing returns. Adding a small percentage of material can be very effective at improving flowability, however another 5% more might alter the material's properties little. • Cost: what is the total cost of using a flow aid? This includes not only the cost of the additive, but also the equipment to store and discharge the additive, as well as the mixing equipment. • Mixing: is there an effective means of adding the additive? What degree of mixing is required to allow for a homogenous mixture of material and additive? It is vital that implementation of a flow additive be evaluated to determine its effectiveness by flow properties testing. A flow additive may require a dynamic ap- proach, rather than always adding a fixed amount to the material. A flow additive may only be needed with a material at certain particle sizes, moisture contents, or temperature ranges. Outside of certain scenarios the flow additive can be forgone or minimized. The use of flow additives is not a trial and error approach but requires applica- tion of the science of bulk material handling. Flow properties should be measured and if gravity flow alone is not viable, the use of a flow aid should be consid- ered. Flow aids provide an active or passive means of maintaining material flow. Mechanical flow aids impart energy to aid material flow, while flow additives, as discussed here alter the material's properties. Factors to use when evaluating flow additive effectiveness include cost, ability to mix and remain mixed, product qual- ity, and result on flowability. When used correctly flow additives can prove a very effective tool to ensure reliable flow. Joseph Marinelli is a consulting engineer and president of Solids Handling Technologies. He has been providing testing and consulting services since 1972. As a former consultant with Jenike & Johanson Inc., he has years of experience testing powders and designing bins and feeders for reliable flow. He lectures frequently on the topic of powder handling, and has published several papers, including an article in a chemical encyclopedia and two in a food powder book. 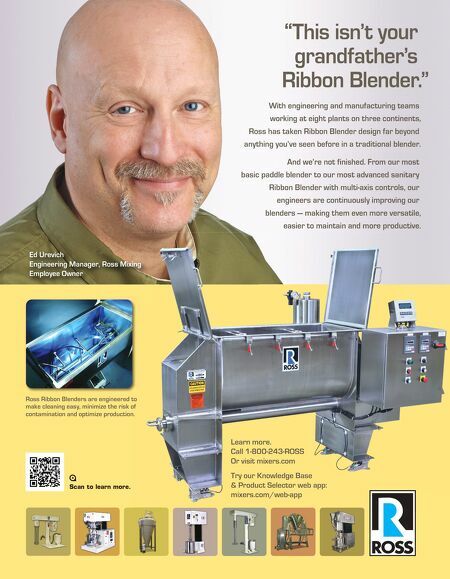 For more information, contact Joe at 803-802-5527 or joe@solidshandlingtech.com. (1) A.W. Jenike, Storage and Flow of Solids, Bulletin No. 123, University of Utah Engineering Experiment Station, Salt Lake City, Nov. 1964 (2) American Society for Testing Materials standard D 6128-16 (3) J.A. Marinelli "Promoting Solids Flow Using Flow Aid Additives" (April 21, 2000) Joe Marinelli Tailored to the needs of the industry Conveyors | Feeders | Loading Spouts | Mixers | Valves | Level Indicators | Bin Dischargers | Dust Collectors | Bucket Elevators | Bag Dump Stations WAM Inc. Texas Plant 1300 Triad Blvd · Fort Worth, TX 76131 Ph: +1 817 232 2678 sales@waminc.com www.waminc.com Discover More! 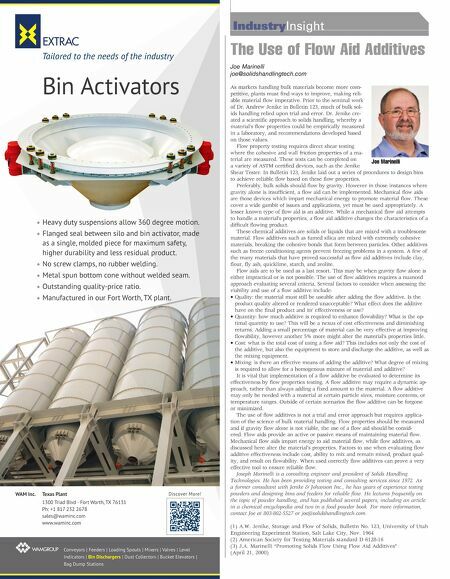 Bin Activators Heavy duty suspensions allow 360 degree motion. Flanged seal between silo and bin activator, made as a single, molded piece for maximum safety, higher durability and less residual product. No screw clamps, no rubber welding. Metal spun bottom cone without welded seam. Outstanding quality-price ratio. Manufactured in our Fort Worth, TX plant.